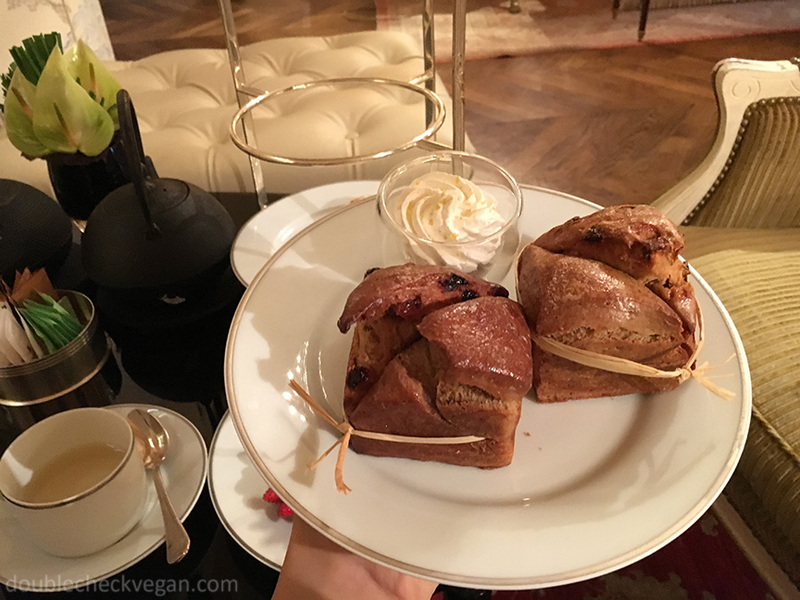 There is so much more vegan food in Paris than there was just three years ago, even vegan croissants! I just got back from visiting my brother, who lives there. 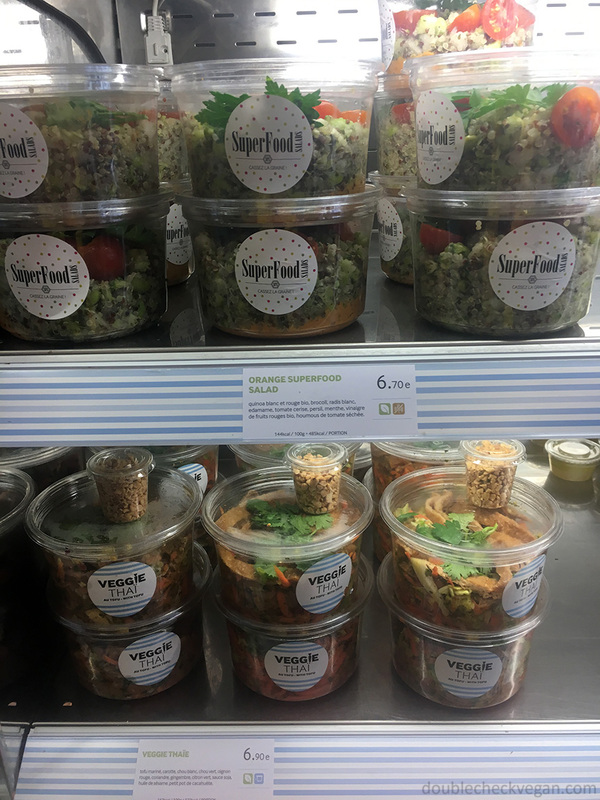 Here’s some amazing vegan food I had and some other vegan treats (clothes and toiletries) I came across. My parents were also there with two other retired couples, so sometimes we ate in large groups at non-vegan restaurants and I’ve also included options from those. This list skews fancy, probably averaging 15 Euros/meal with some exceptions. The cafe VG was the least expensive for the amount of food. 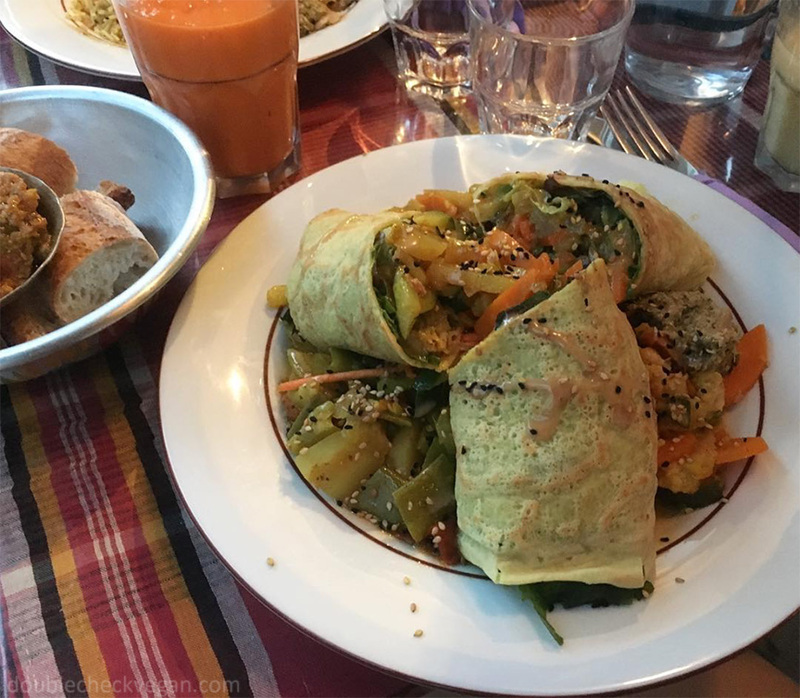 Without further ado, here’s some vegan food in Paris. We ate at Le Faitout twice – once for lunch, and once for a late night (11pm) dinner surrounded by groups of hip young people enjoying drinks. The owner is very friendly and talkative. At lunch I had the cheese plate – my favorite was the hibiscus cheese in the upper right corner. I think the cheeses were all made from different types of nuts and one from tofu if I remember correctly. My brother’s favorite was the soft one in the bowl. I really enjoyed the vegan steak pictured below with excellent fries. I didn’t try my brother’s lasagna but it looked good. 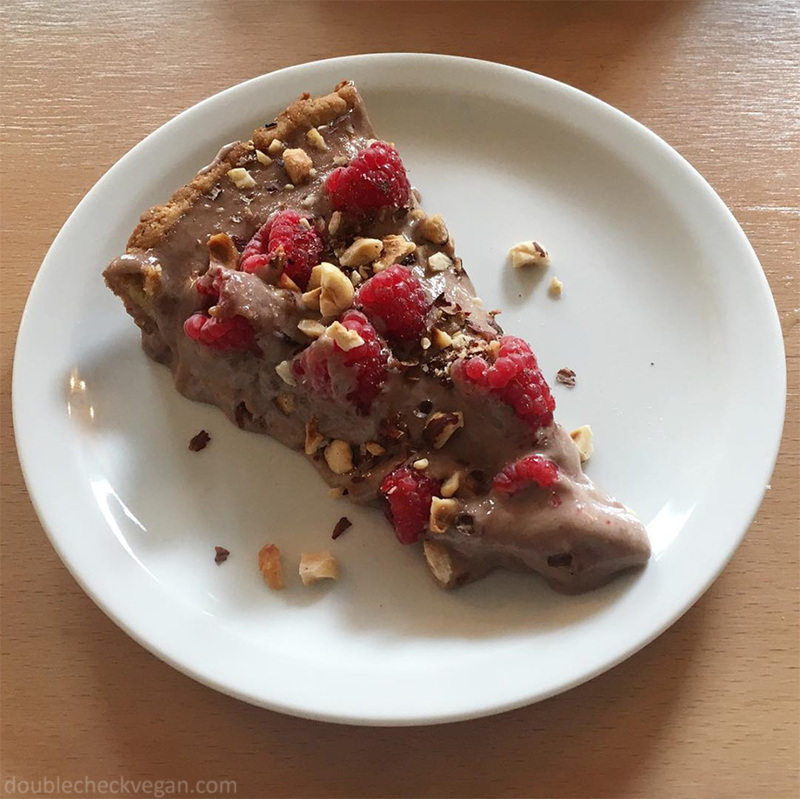 The vegan raspberry tart pictured last was really amazing – wish I was eating some right now! 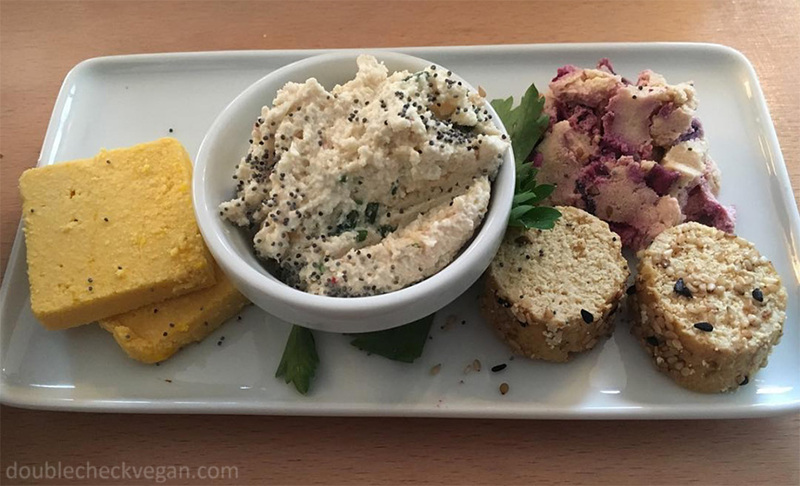 Vegan cheese plate at Le Faitout Vegan in Paris. 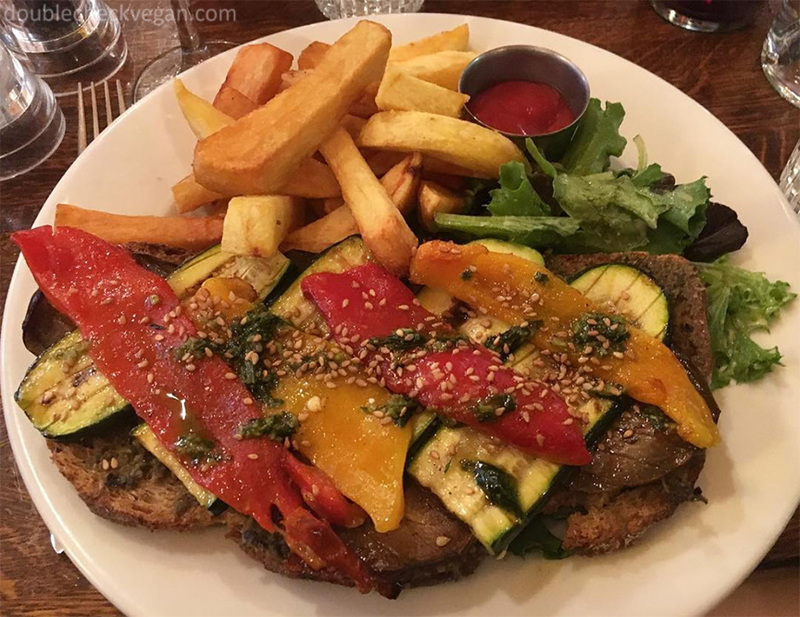 Vegan steak frites at Le Faitout Vegan in Paris. 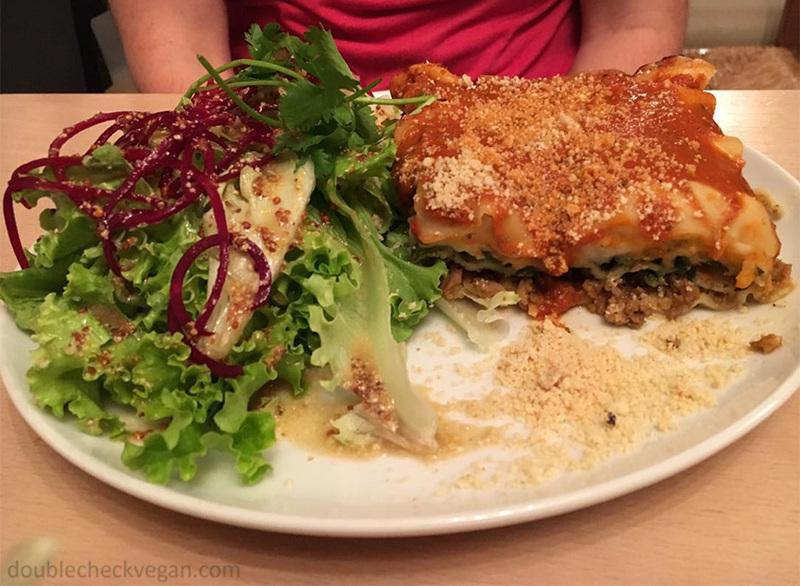 Vegan lasagna with salad at Le Faitout Vegan in Paris. Delicious vegan raspberry tart from Le Faitout Vegan in Paris. Carmen Ragosta is a renaissance woman who runs a boutique and cafe. The boutique sells her own modern one-of-a-kind clothing designs which she sews herself out of all-vegan fabrics. And in the same space she also serves her own vegan cooking. Ragosta has had the space for over 15 years, and it was in the last couple of years that she made everything totally vegan. I had the set lunch which included very nice preparations of vegetables and tofu, and I had a delicious chocolate tiramisu. I also did the only bit of clothes shopping for myself on this trip here – I got a Carmen Ragosta dress! (picture coming soon) She can customize something for you if you don’t find your size in the store. 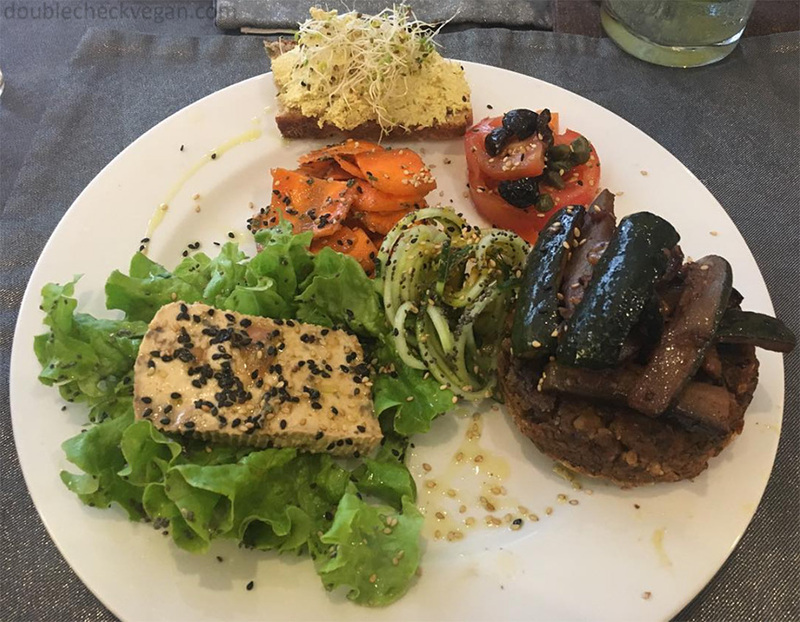 Vegan plate lunch at Carmen Ragosta in Paris. 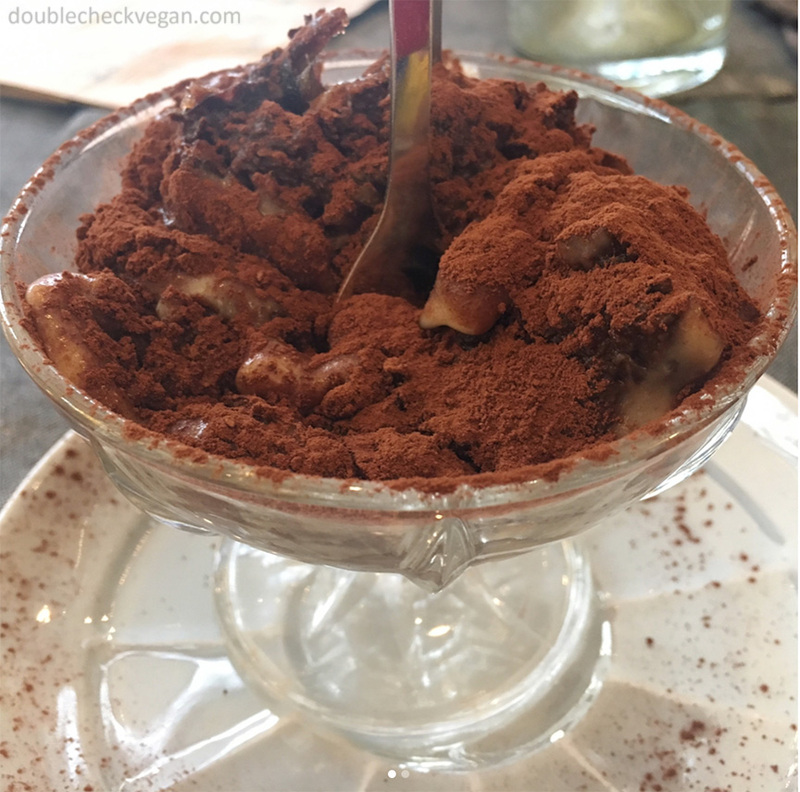 Vegan chocolate tiramisu at Carmen Ragosta in Paris. Pierre Sang was a finalist on France’s Top Chef. Now he has two restaurants in Paris and is opening a third. His eponymous restaurant on Rue Oberkampf has no menu. They serve a six course meal which changes every week, for 39 Euros. The meal usually includes meat and dairy BUT when I told them I was vegan they said no problem. The dishes were wonderfully creative. In maybe two or three instances I got the same dish as my family minus a few non-vegan items. In other cases they actually had a substitute for me. 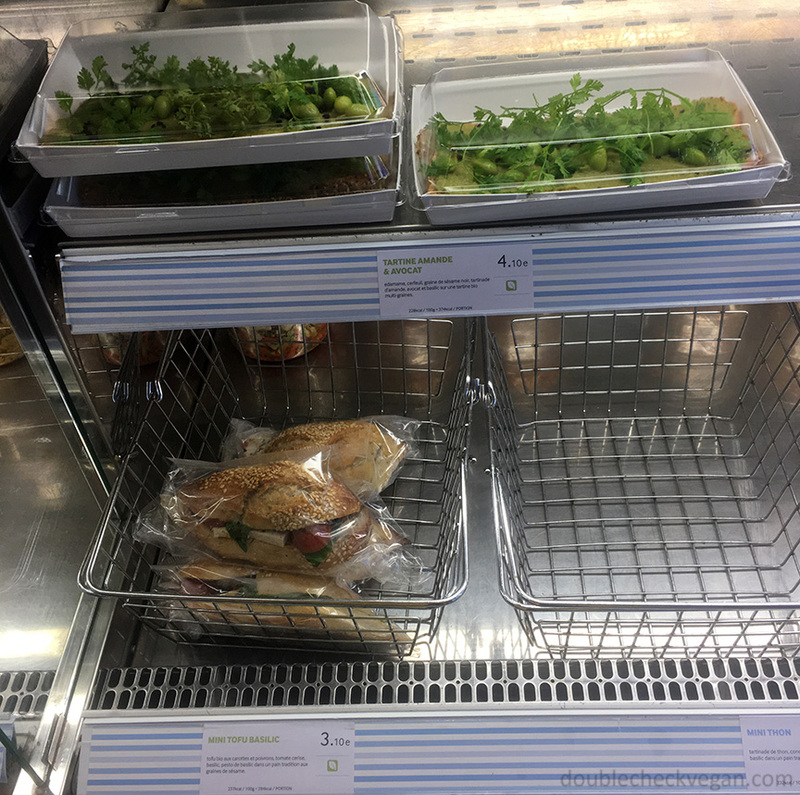 Even so, I thought 39 Euros for the uniqueness, quality, and quantity was a bargain and the food was comparable to far more expensive restaurants. 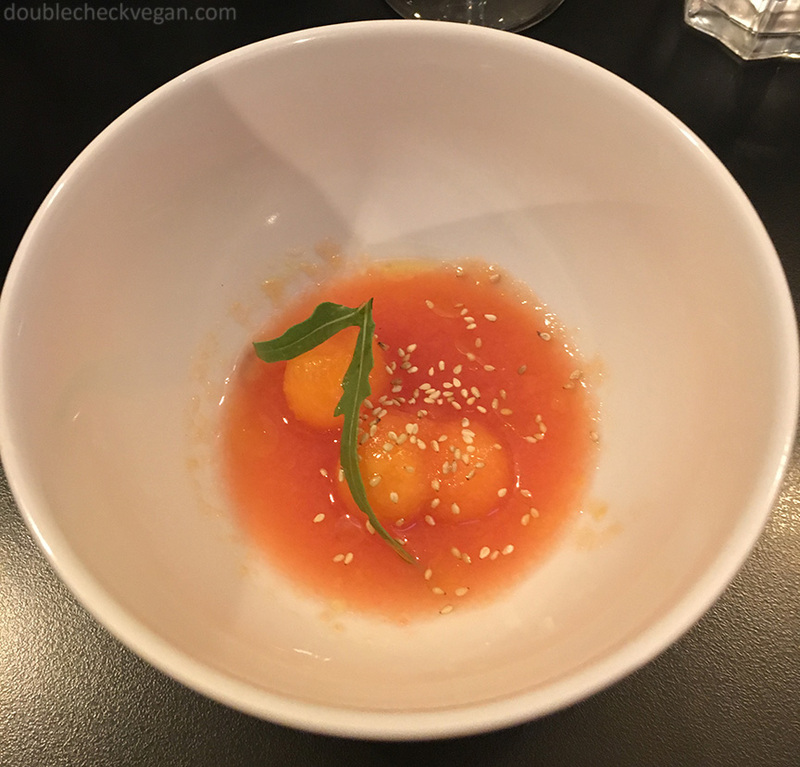 Melon and watermelon gazpacho with tabasco sauce at Pierre Sang in Paris. Gentle Gourmet is an upscale all vegan restaurant in the 12th arrondissement. You can tell it’s fancy because they served an amuse bouche (free palate cleanser) at the beginning of brunch. The food is pricy but also creative and tasty. My brother and I both loved the lavender watermelon gazpacho. I also had major envy over his portobello burger which came with a perfect vegan béarnaise sauce. And yes, they have vegan macarons! 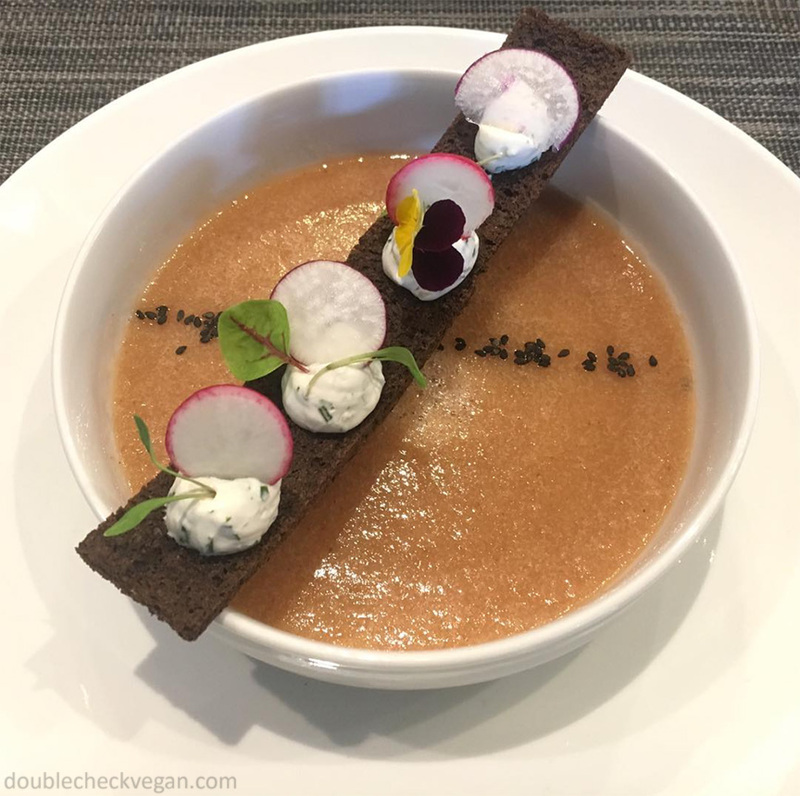 Lavender watermelon gazpacho with vegan cream at Gentle Gourmet in Paris. 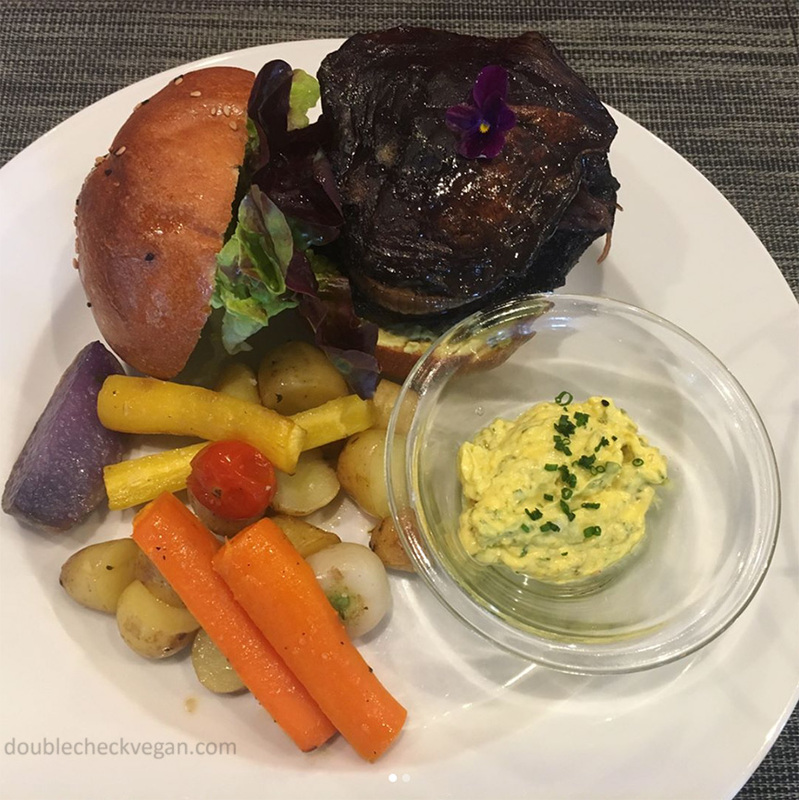 Vegan portobello burger with vegan bernaise sauce at Gentle Gourmet in Paris. 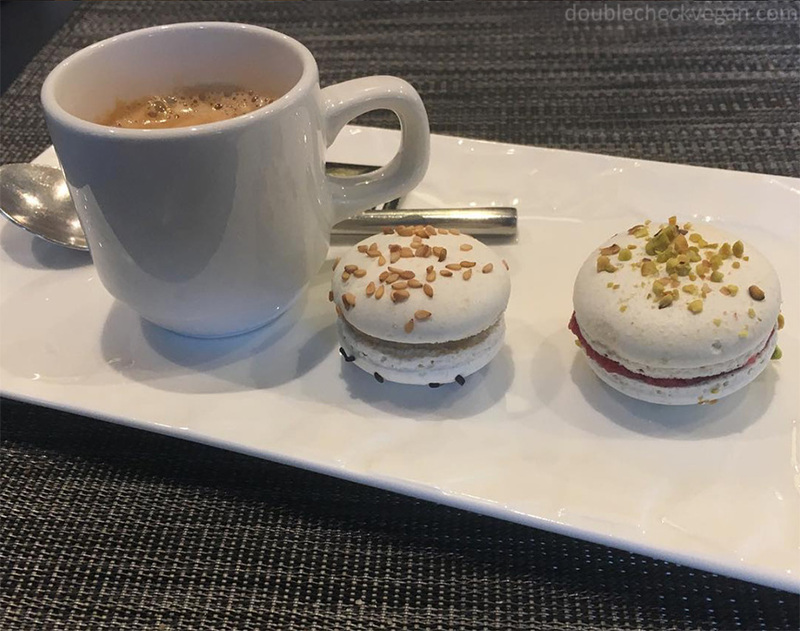 Vegan macarons and espresso at Gentle Gourmet in Paris. Naturalia is a chain of organic grocery stores. They recently made two of their Paris locations completely vegan. 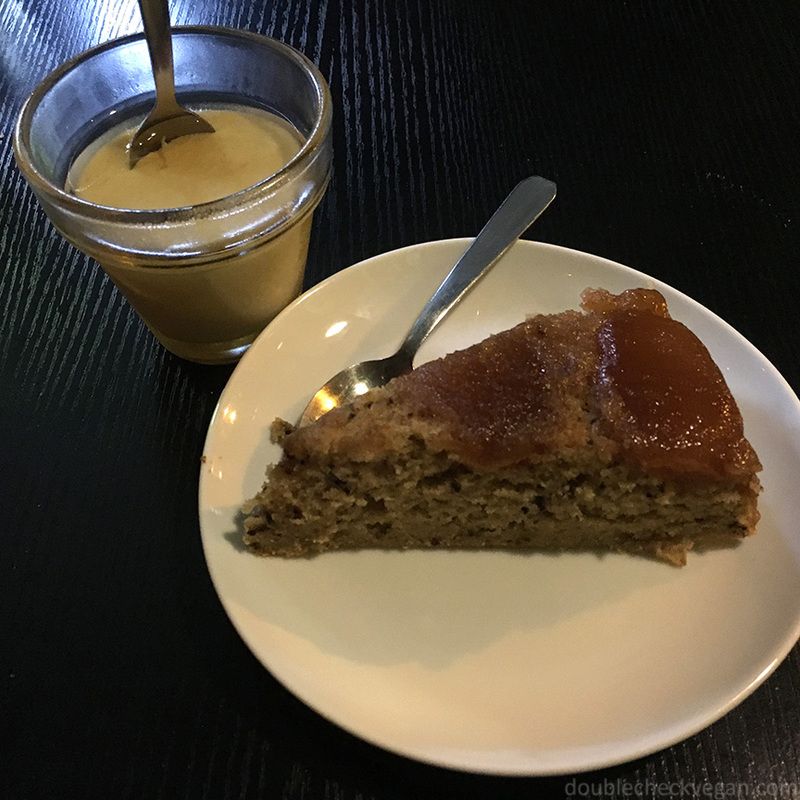 I went to the vegan branch at 39 Rue Merlin in the 11th arrondissement. The other vegan branch is located at 149 rue de Rome in the 17th. 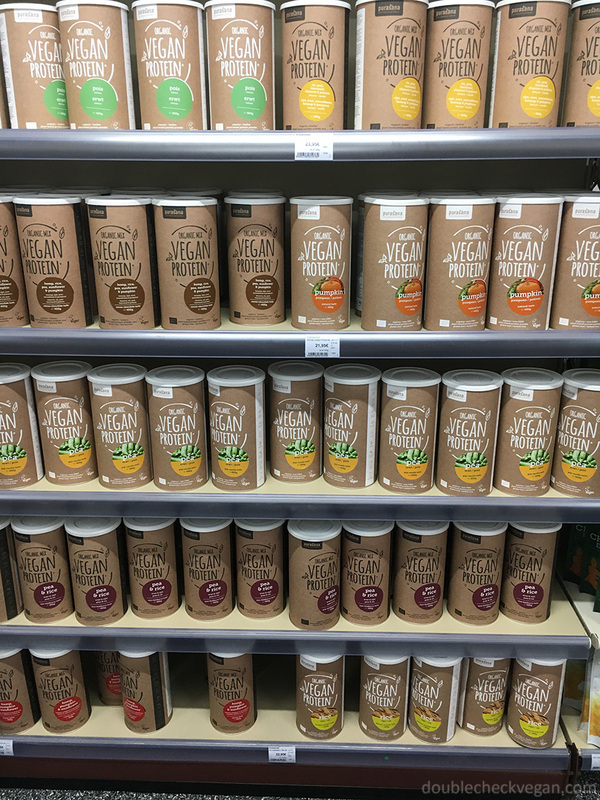 The Rue Merlin branch carries vegan cheeses, vegan yogurts, vegan protein powders, vegan milks, vegan cosmetics and toiletries, vegan cookies, vegan candies, vegan cookbooks and much more. 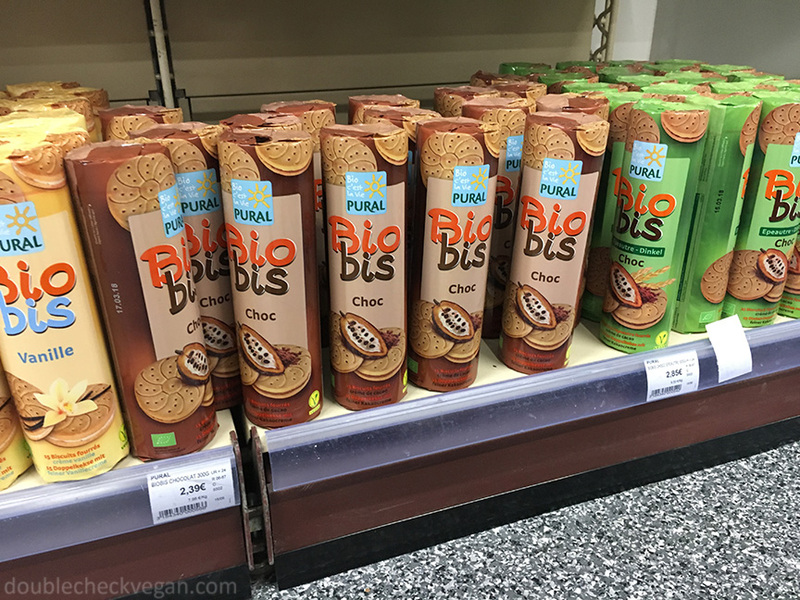 I was thrilled to find a vegan version of Bis cookies which were an old favorite of mine. 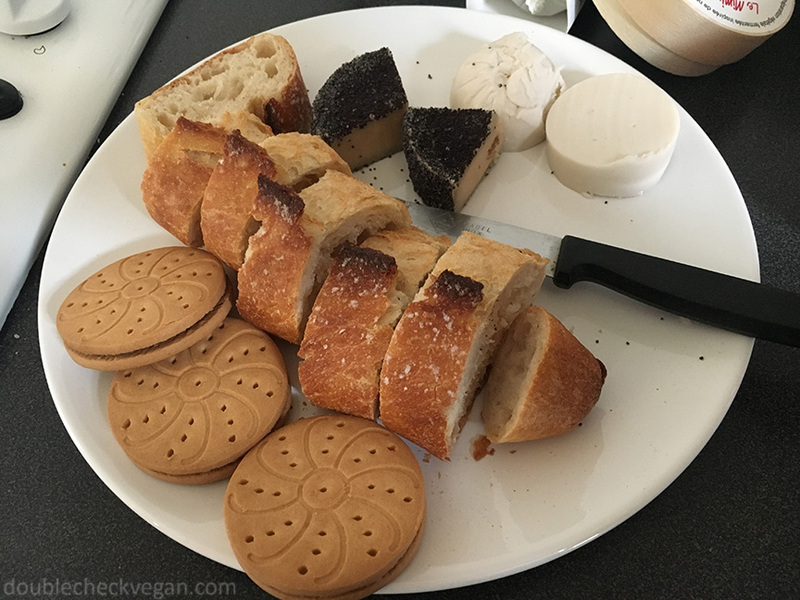 I particularly enjoyed the Le Mini vegan cvheese from Frawmagerie and the VEGO chocolate hazelnut bar. I also got a very cheap hand cream from Lavero that I’m addicted to! 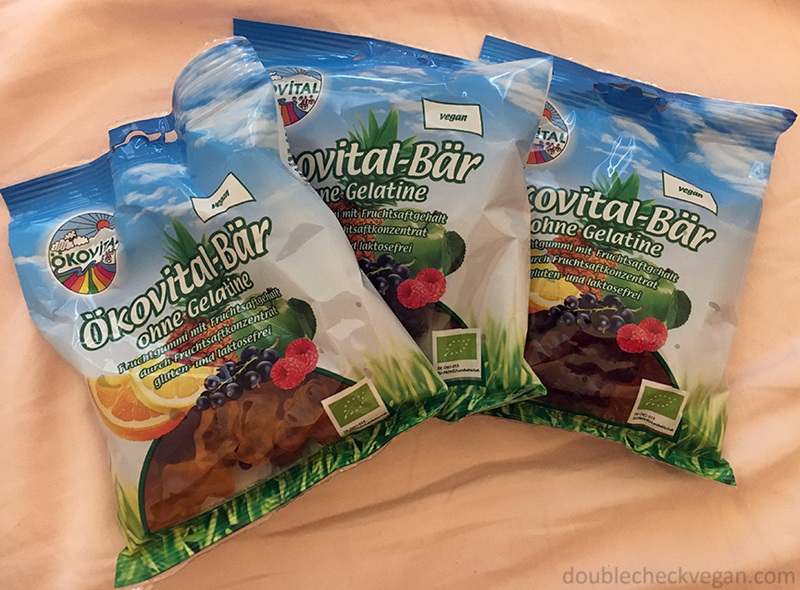 And I stocked up on Ökovital-Bar vegan gummy bears that include an amazing black current flavor! Like many vegan gummy bears, they’re a little softer than bears with gelatin. If you want to get that familiar teeth-resistance, just leave the bag open for a week – works like a charm! Oh, and don’t forget the vegan condoms. 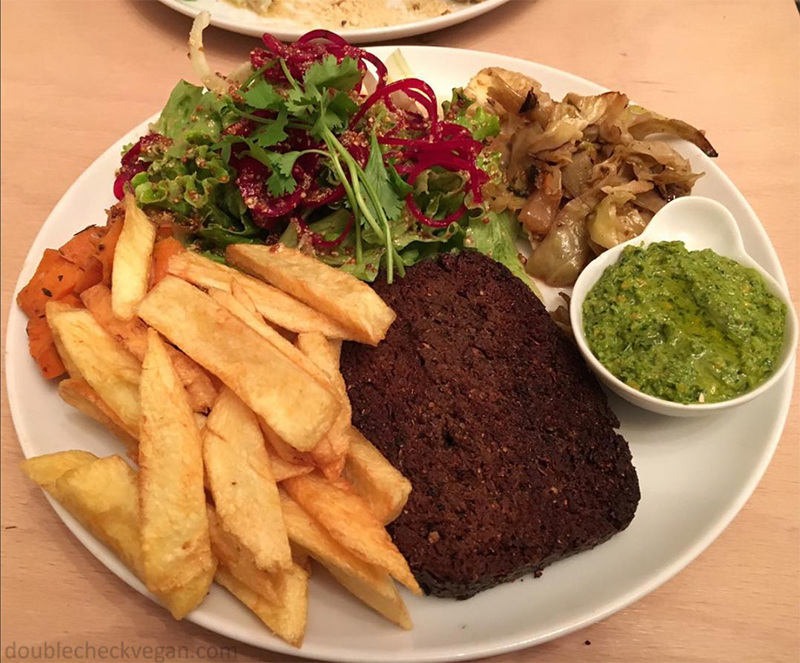 Naturalia has one other completely vegan location in Vincennes, a suburb just east of Paris. 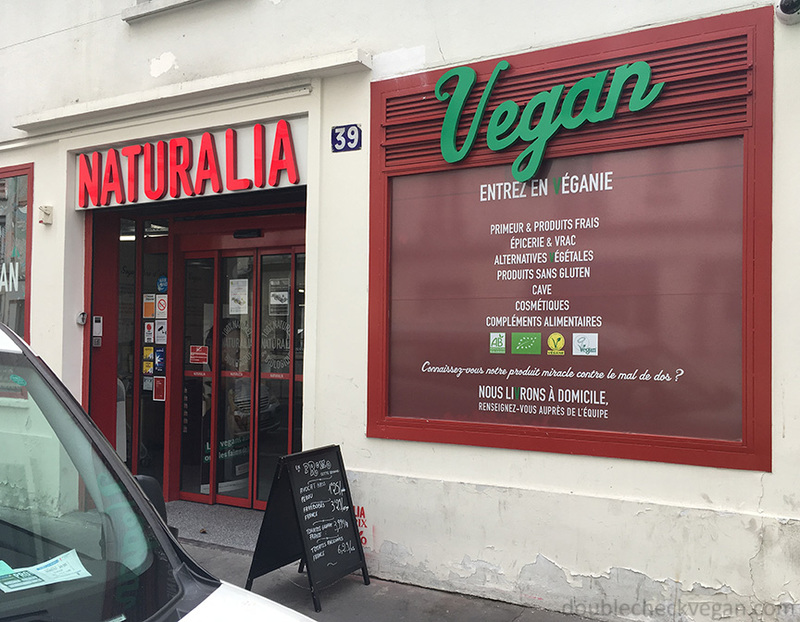 Naturalia Vegan branch in Paris. Vegan and organic Bis cookies at Naturalia in Paris. 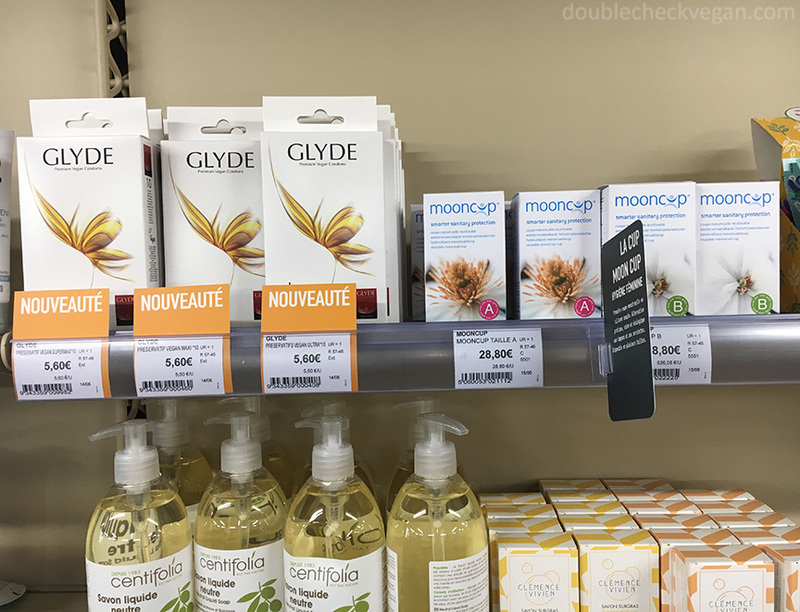 Vegan condoms and menstrual cups at Naturalia in Paris. 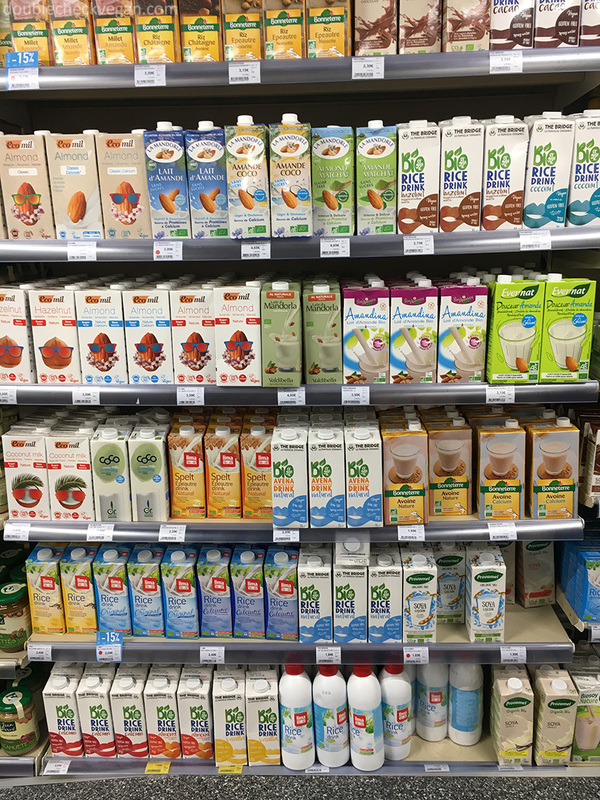 So many kinds of vegan milk at Naturalia in Paris. So many kinds of vegan protein at Naturalia in Paris. Some vegan cheese and vegan cookies from Naturalia in Paris. 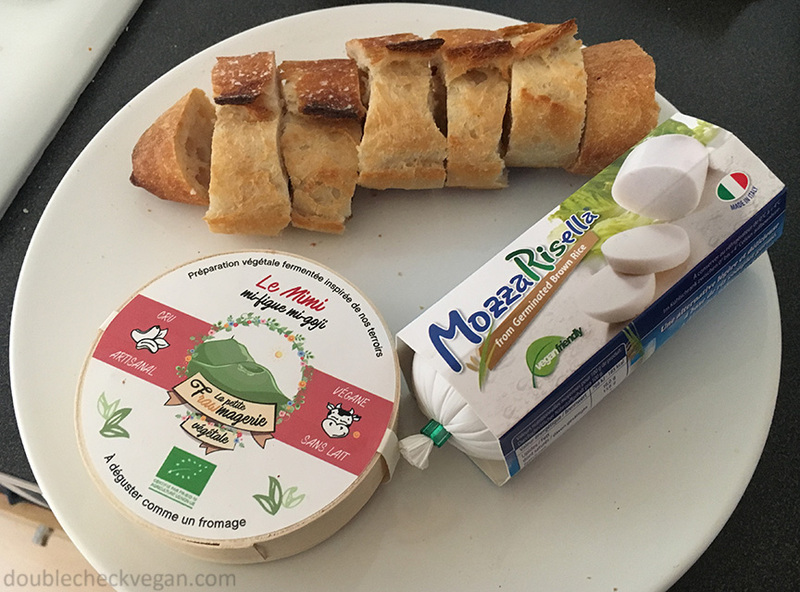 Vegan cheeses from Naturalia in Paris. The one on the left was especially good. Amazing vegan gummy bears from Naturalia in Paris. Brasserie Lola looks and feels like a classic casual Parisian brasserie you might find on any corner. The menu lists many typical brasserie dishes without explicitly stating that they’re vegan. My parents kept double-checking on my behalf even though I assured them it’s a vegan restaurant. My picky family enjoyed their meal, and perhaps even more so, the ambiance. The fries were especially delicious. 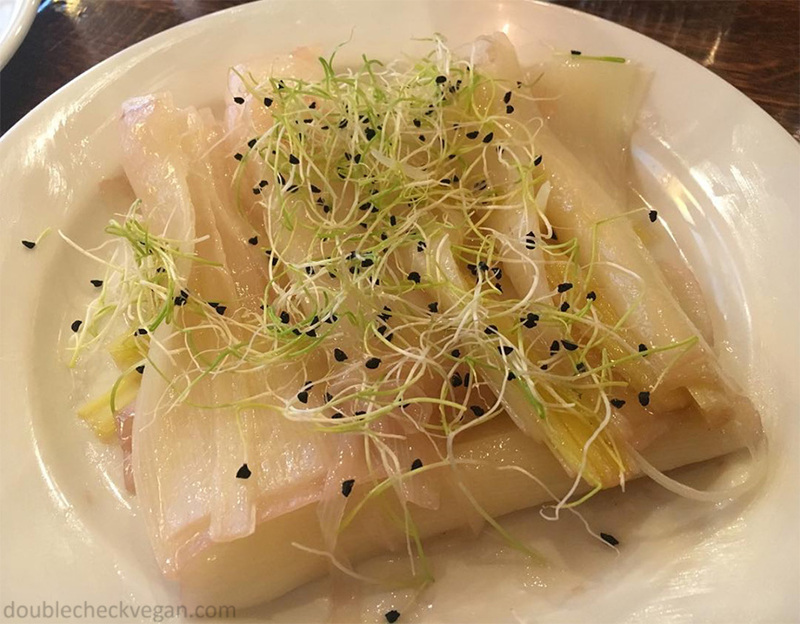 Classic leeks vinaigrette at the vegan Brasserie Lola in Paris. Crostini with fries at the vegan Brasserie Lola in Paris. 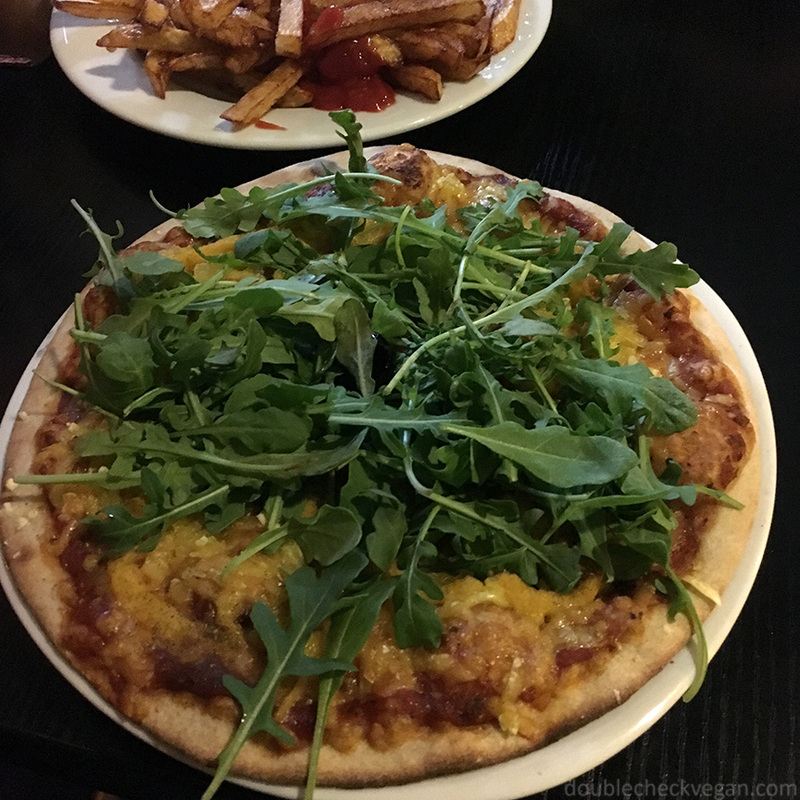 Craving vegan pizza in Paris? Veg’Art specializes in vegan pizza but they also serve other things like fresh salads and are open pretty late. It’s a small cafe in the bustling Rue Oberkampf area. The walls are plastered with framed photos of animals and a pro-vegan message. I really enjoyed my pizza and the apple cake. Vegan pizza at Veg’Art in Paris. 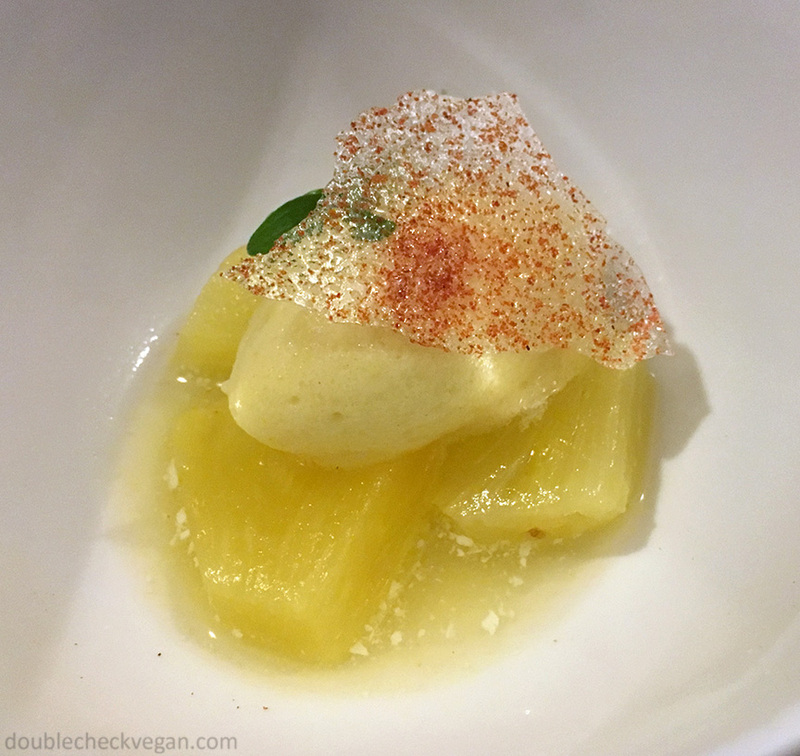 Vegan dessert at Veg’Art in Paris. 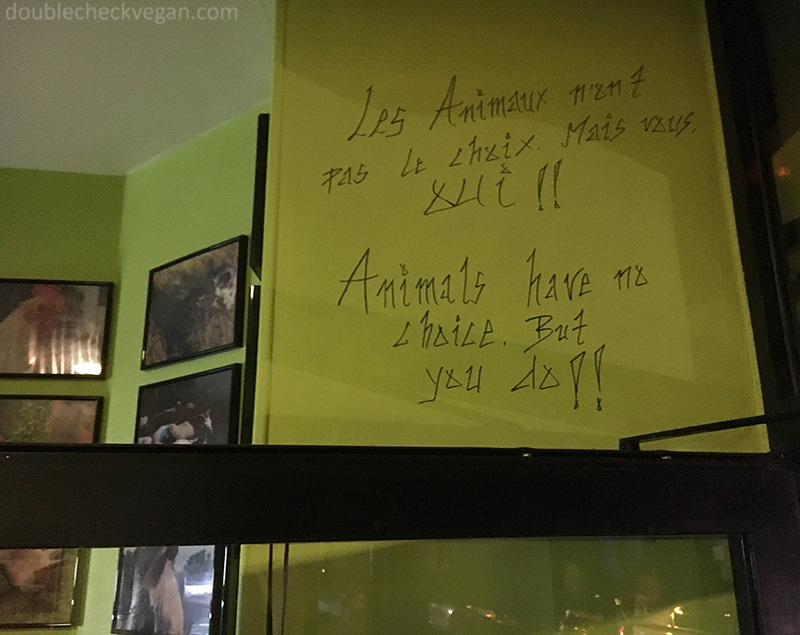 Vegan message at Veg’Art in Paris. 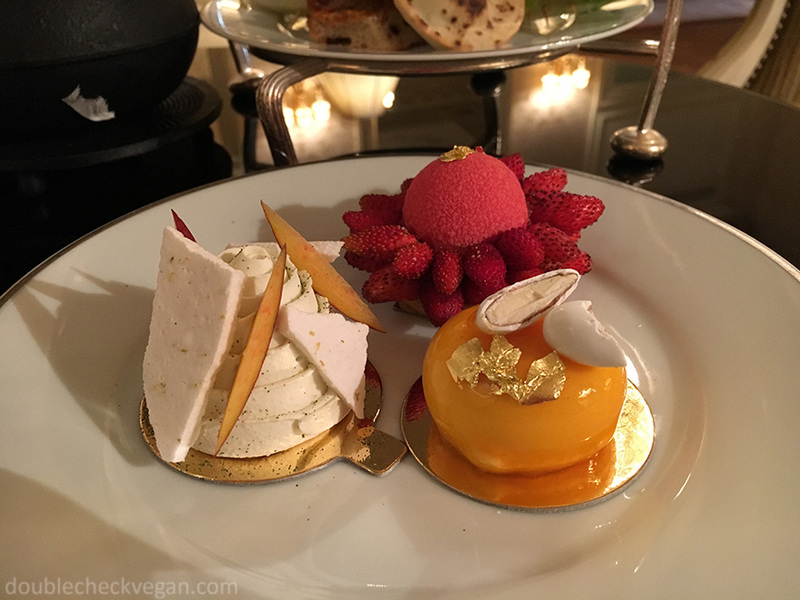 Having vegan afternoon tea at the Shangri-La with my mom was a highlight of the trip. See here for my full write-up on this totally decadent experience. I can’t figure out if Primeur is vegetarian or all vegan and the waitress only confused us more. My brother is fluent in French and I speak okay. When he asked if certain items were vegan, the waitress said no they were not because they contained gluten. WTF? We were never able to come to an understanding with her so I just ordered a salad that was definitely vegan AND gluten free just in case in this bizarro world somehow gluten actually means cheese or something. The salad was really refreshing and healthy tasting and quite large. 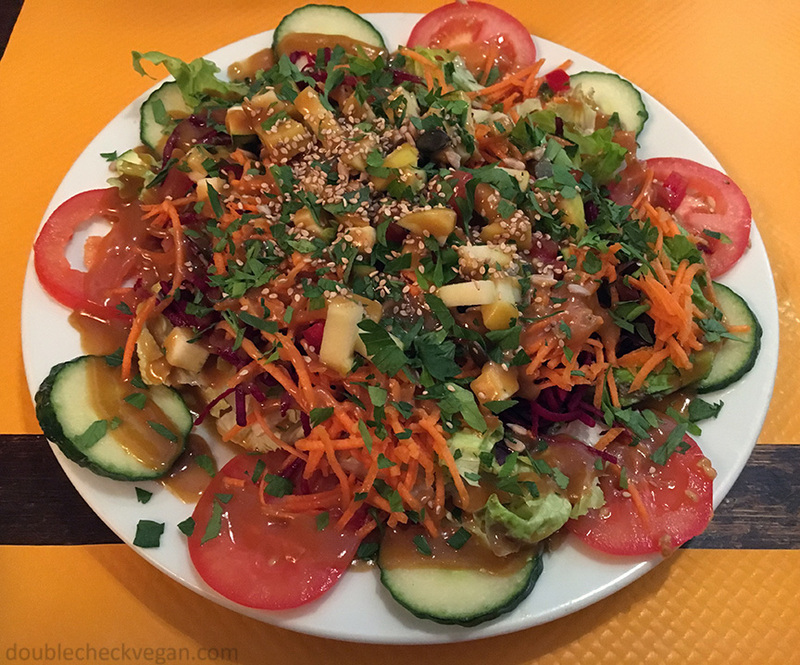 Vegan salad at Primeur Cantine in Paris. Walking around the 9th arrondissement during those odd hours between lunch and dinner, VG was the only vegan spot that seemed to be open. It’s a vegan fast food joint! The burger was good and had interesting toppings. The fries were a bit greasy. 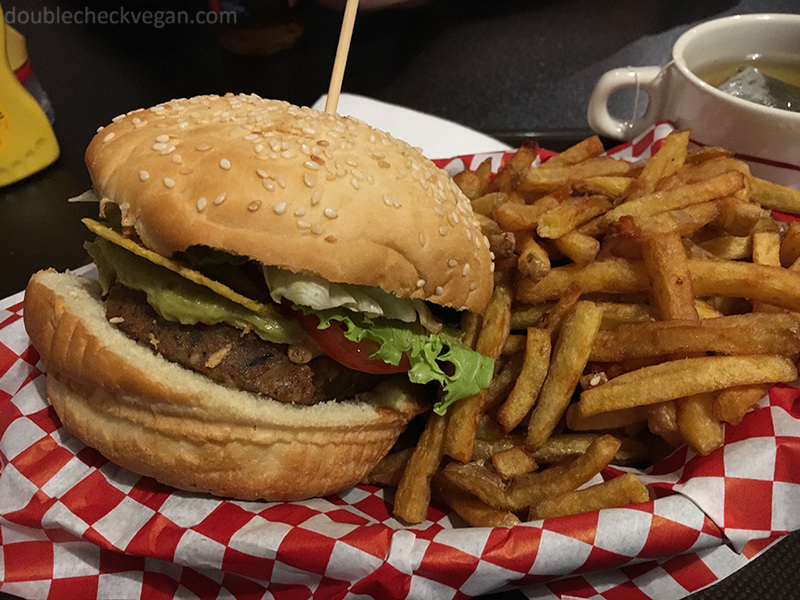 Vegan burger at VG in Paris. This is a casual Bengali cafe in the hip 11th arrondissement. Our waitress was the only server I encountered at a non-vegan restaurant who understood the difference between “vegan” and “gluten-free.” The juice I had, I think it was carrot apple ginger, was excellent. The balance was perfect! And I loved my huge entree. It was a special and I remember the name sounded like Colo Hummus. I’m sure I’m not spelling the first word right. It was basically a very flavorful vegetable burrito but in some sort of crepe-like wrap. Vegan special at Paris Féni in Paris. Laelo is a vegan bakery with pastries, desserts, juices, cereals, bowls, and a little salad bar. There were a lot of sweets I would have liked to try if I hadn’t eaten too many vegan gummy bears earlier. The chocolate croissant was solid – it was at least as good as one from Pain Quotidien, that’s for sure. The melon juice was nice. 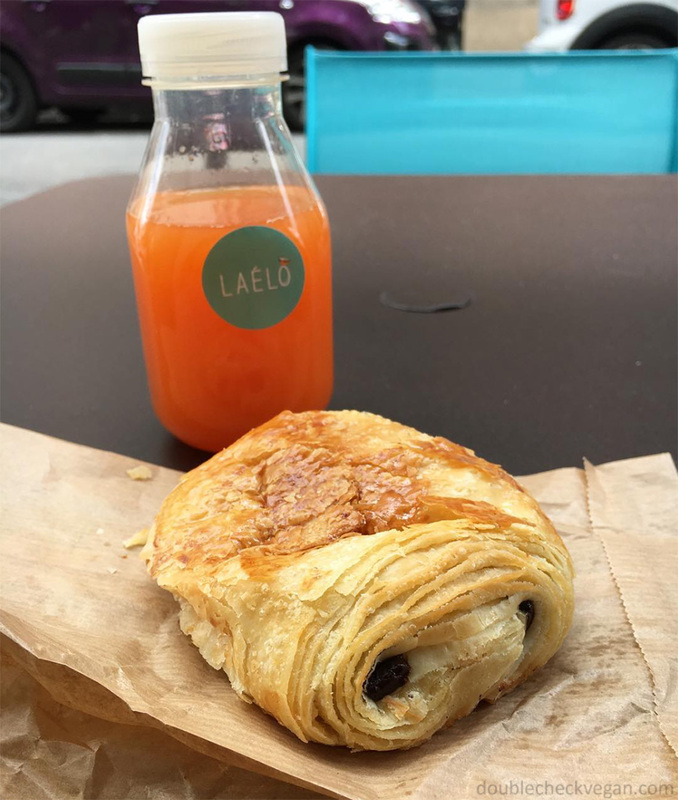 Vegan chocolate croissant and melon juice from Laelo in Paris. 1944 is a cute gift shop. I got my husband some nice socks with cats on them. They had some purses, tops with graphics, and a couple vintage-inspired blouses, as well as jewelry, art, pens, and other things. I have since read that they also serve coffee and maybe even food but while I was there I didn’t happen to notice any hint of this. Cojean is a chain that sells prepared healthy foods and juice. Their food is all clearly marked – the leaf symbol means vegan, and the carrot symbol means vegetarian. When I was there, they had two different vegan superfood bowls, and a vegan tofu basil sandwich, among other options. I think they have around 20 locations in Paris with varying opening times. Some vegan options at Cojean in Paris. 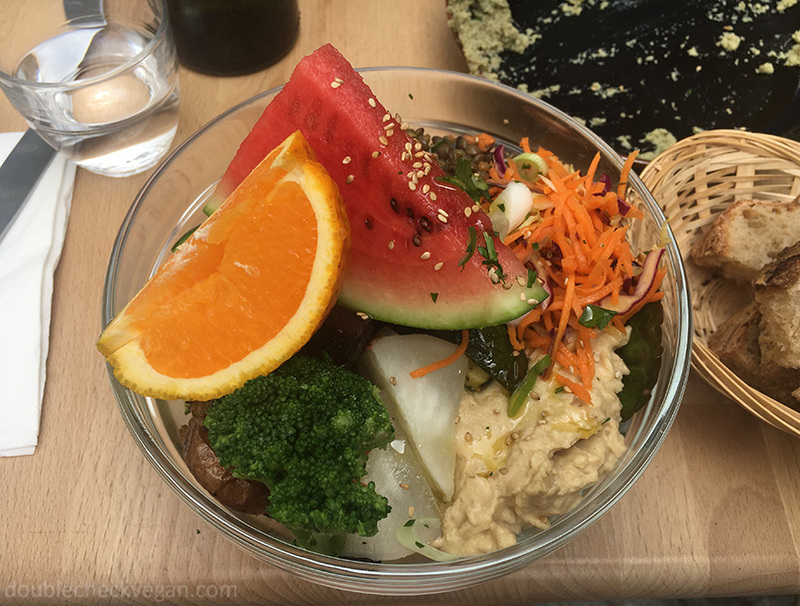 Vegan superfood salad at Cojean in Paris. Some more vegan options at Cojean in Paris. I ate at this Moroccon/Algerian restaurant with my family. 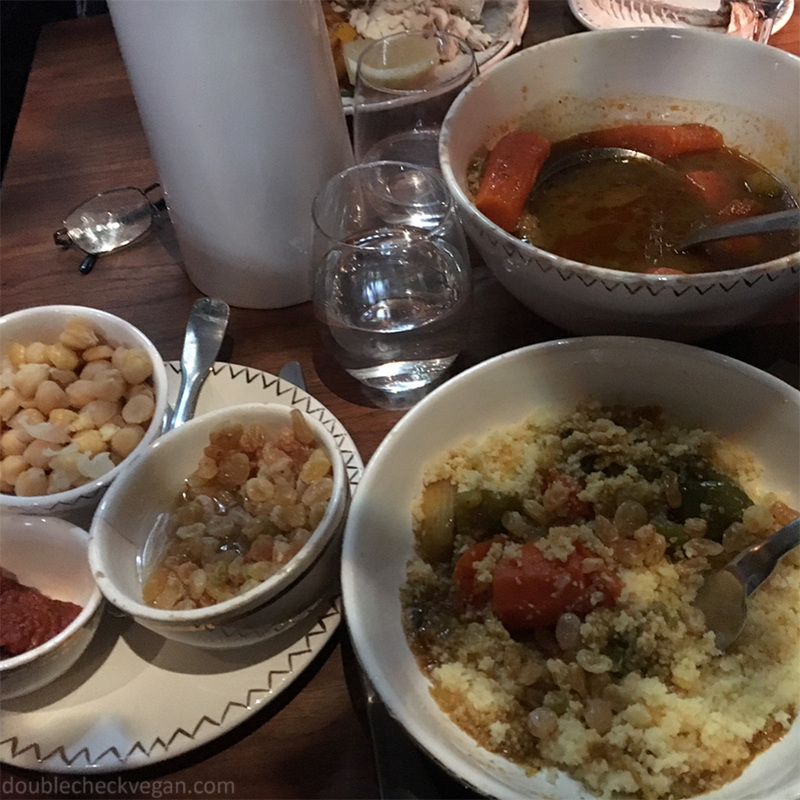 There was one vegetable tagine and one vegetable cous cous which were vegan. 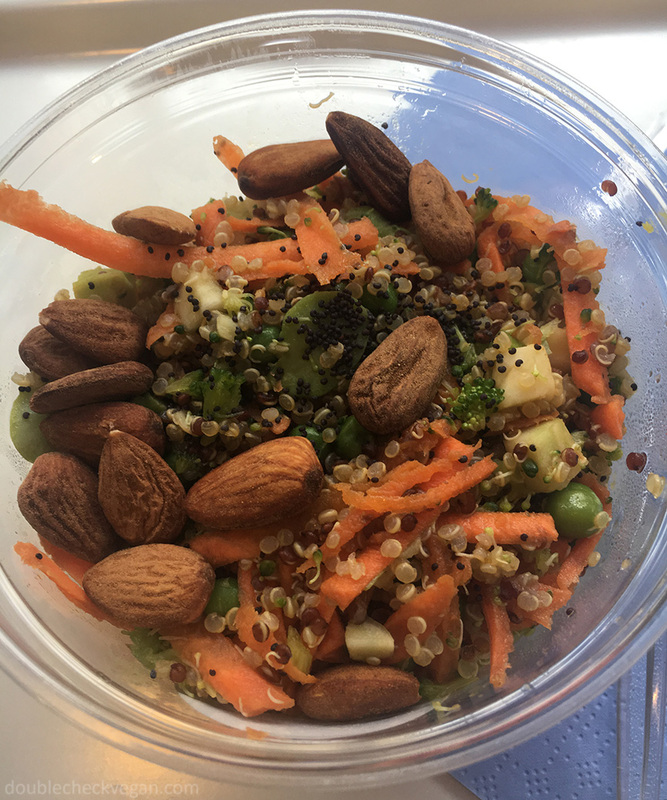 I would double-check if ordering – I don’t remember if they altered the vegetable cous cous for me or if it was already vegan, but it probably already was. There were also a few vegan appetizers. Nothing on the menu is marked but the staff were accommodating. Seven vegetable cous cous at Le 404 Restaurant in Paris. 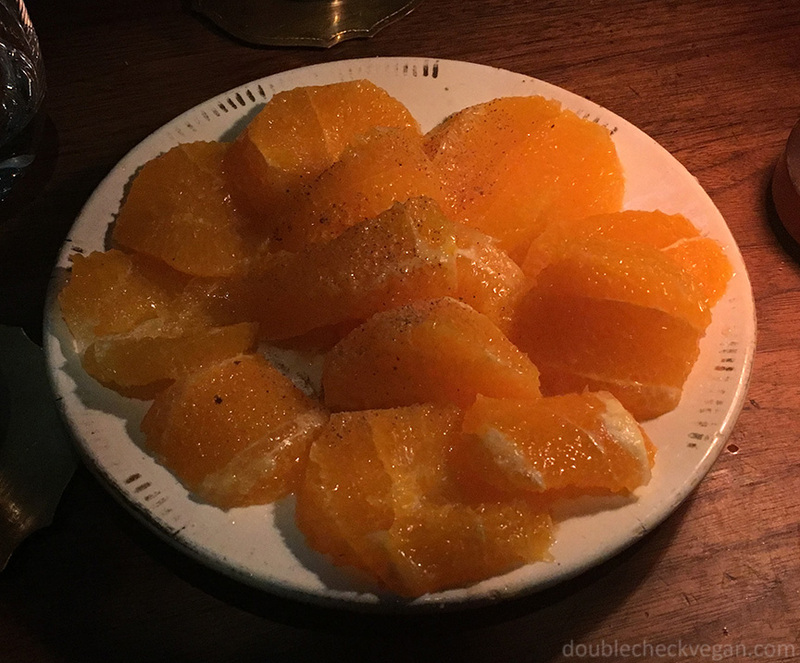 Refreshing orange dessert at Le 404 Restaurant in Paris. NOT TO BE CONFUSED WITH THE NEW ALL VEGAN PARIS CAFE CALLED H.O.P.E. WHICH PROBABLY WOULD HAVE BEEN WAY MORE EXCITING. I’m pretty sure my friend who took me here got this placed mixed up with the new all-vegan restaurant of a similar name. But this Hope Cafe in Montmartre did have a few vegan options, and fresh juices. I had the veggie maki and my friend had the fresh salad – both vegan. The bathroom actually was really cute. If you’re in the neighborhood it’s a solid option and only a 20 minute walk from the famous weekend flea market at St. Ouen. Vegan maki at H.O.P.E. cafe in Montmartre Paris. Fresh salad at H.O.P.E. Cafe in Montmartre in Paris. I came to Liza with a large group so we didn’t get to order a la carte. 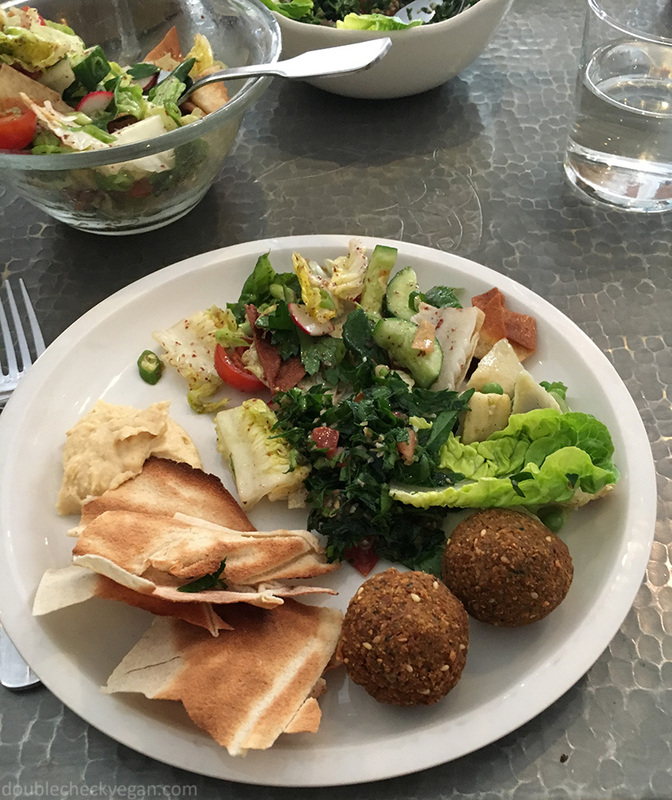 However, several of the dishes brought to the table were vegan including the refreshing fattoush salad. There were also falafel, and hummus, and two of the sorbets were vegan – I think! I wasn’t one hundred percent confident in our server’s knowledge of what was in what. Fatoush salad and hummus at Liza in Paris. 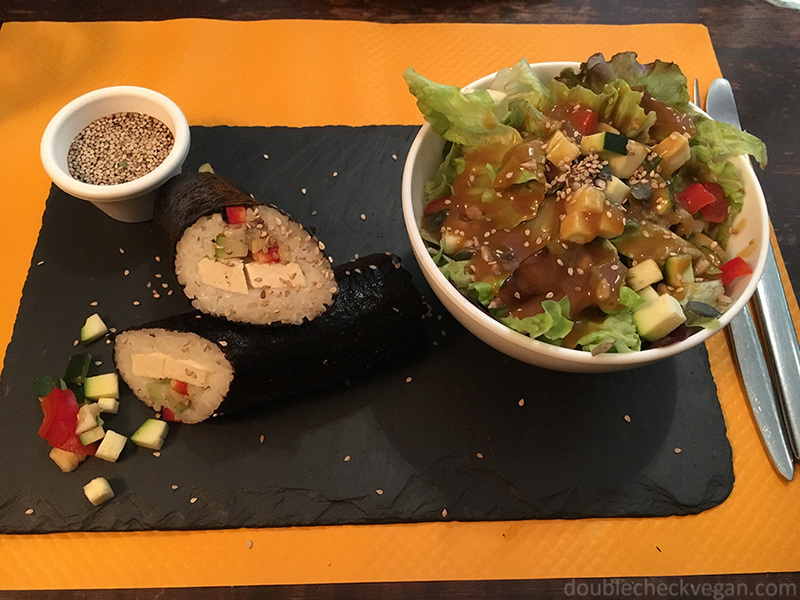 Of course there wasn’t time to try everything, but there’s SOME vegan food in Paris for you. Hoping the next time I make it back, there will be even more. I’m going through your great list right now while prepping my vegan food list, as I’m leaving for Paris tomorrow. Thanks for the excellent report. 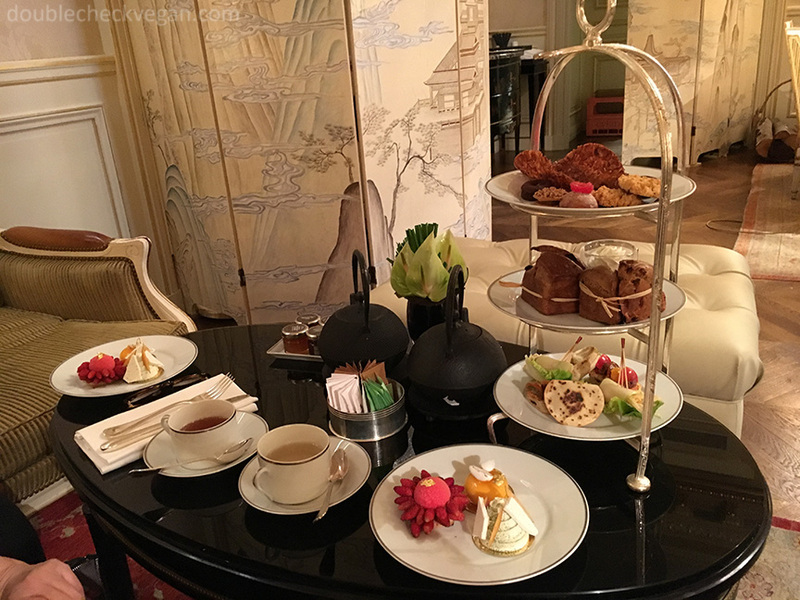 I’m definitely going to hit up that fancy tea at the Shangri-La!